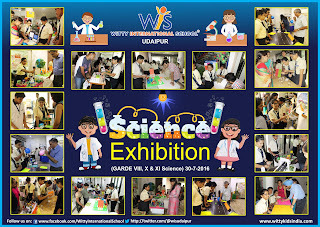 Witty International School, Udaipur organized Science and Math project exhibition in consonance with CCE Witty parent Mr. Sanjay Jhanwar and Mrs. Chetna Jhanwar inaugurated the exhibition with the students of Grade VIII, X and XI Science. Students made working models on the topics-Rain water harvesting, Biogas, Hydroelectricity, Hospital Disposal System, Hydraulic Bridge, Hydraulic Escalator, Smart City, Alternative sources of Energy, etc. 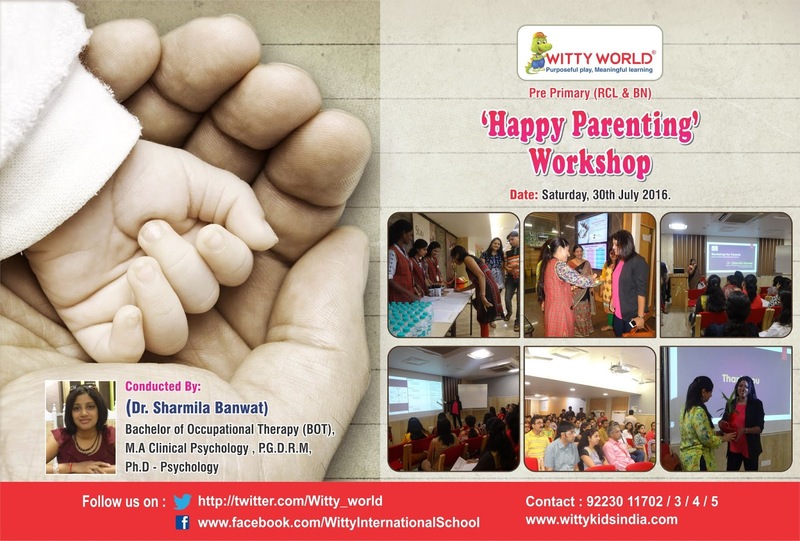 Parents cheered, motivated and encouraged the participants after seeing some fun games like –magical patterns, fun with numbers, mirror magic. Principal Mrs. Shubha Govil said that the motive to conduct Science and Math exhibition was to enhance and enrich the technological, creative and intellectual skills of the scholars. 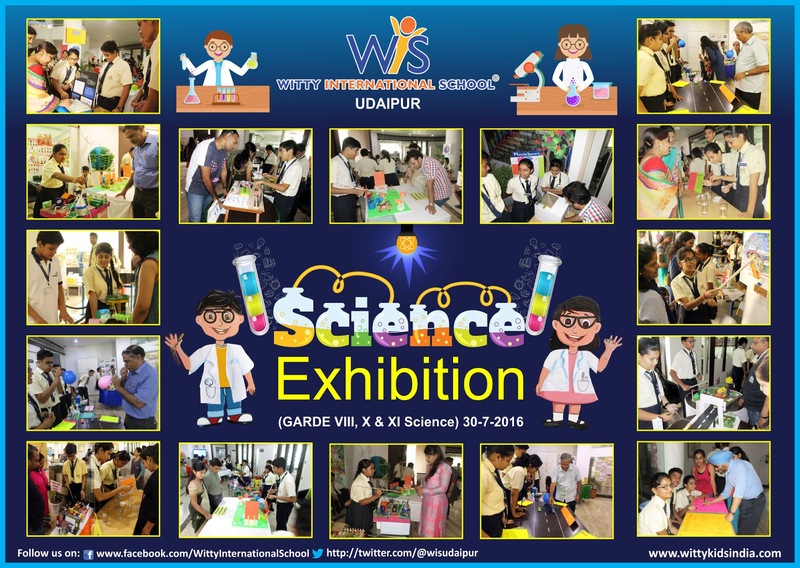 It was a great exposure for the student who witnessed and participated in the exhibition. Kids like to eat chocolates, but they don’t know how it is made. 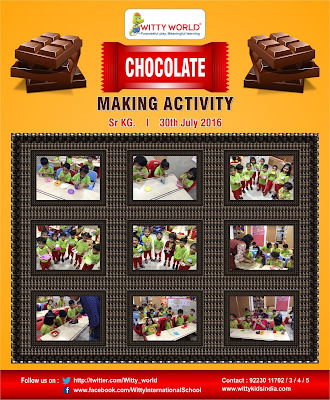 So, an activity related to chocolate making was held on 29th July at WIS,Bhilwara. 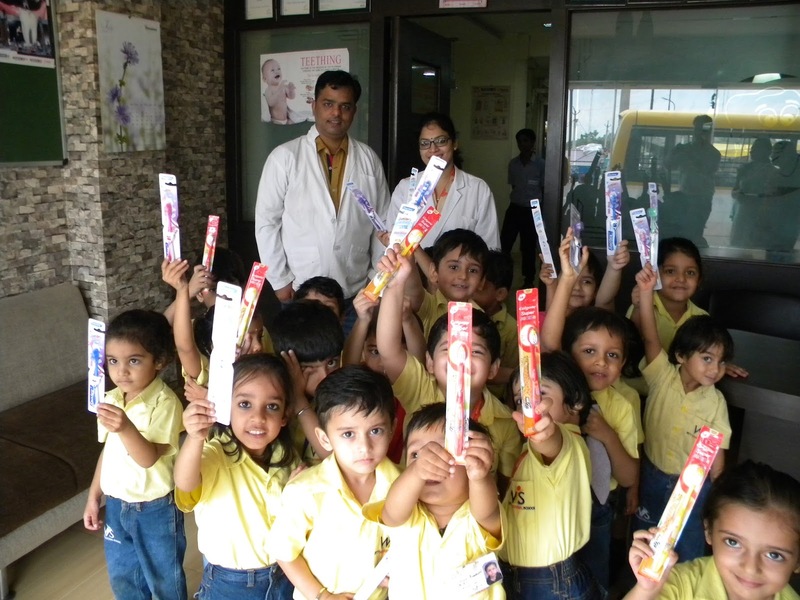 Children of Sr.Kg. made the chocolates and learnt that chocolates are made up of cocoa beans which are roasted and ground. This cocoa powder is mixed with sugar powder, coconut powder,milkmaid and cocoa powder and rolled in desiccated coconut powder. 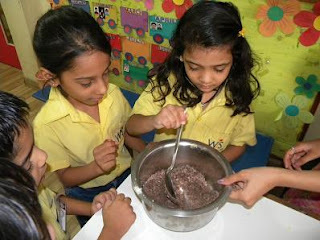 Children enjoyed eating their self made chocolates. Regular visits to the dentists are not only important for a beautiful bright smile, but also extremely important to maintain your overall general health. People often ignore their oral health and hygiene but it is important to note that oral infections can be fatal if left untreated. You dry me and roast me and crush me down. Just lift me up and pour me down. 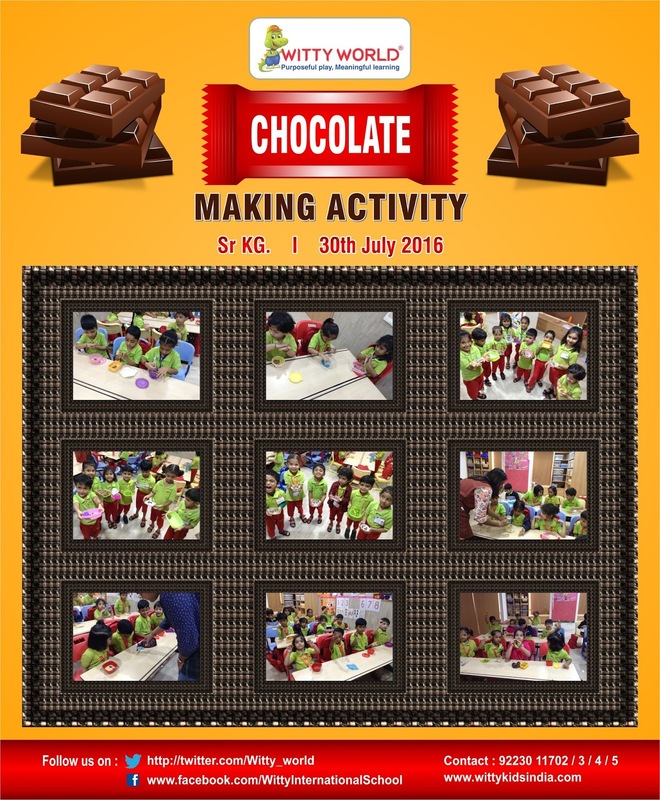 The children of Sr.k.G Witty World, Bangur nagar made chocolate balls on Friday 29th August 2016 . 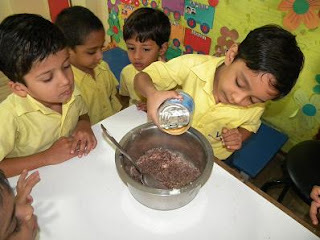 Children mixed biscuit crumbs, chocolate syrup and condensed milk to make chocolate balls. Children were excited to relish the yummy chocolate balls made by them and thoroughly enjoyed the sensory experience. 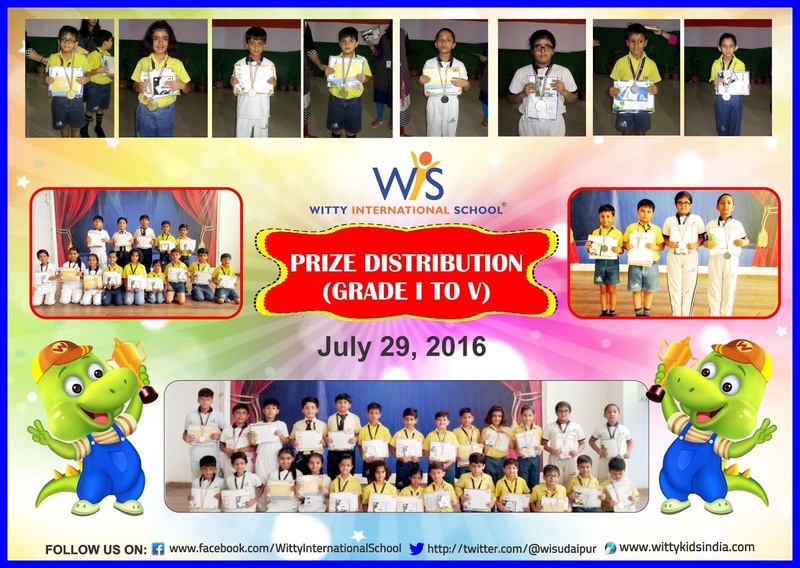 Wittians of Primary section witnessed and participated in the felicitation programme where the achievers of Science Olympiad Foundation were endorsed with Medals , Certificates and Gift Vouchers. 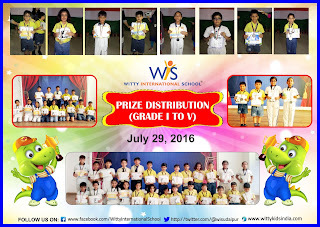 Primary Co-Ordinator Mrs.Suryakanta Jain praised the efforts of Wittians and added that we are what we repeatedly do. Excellence then, is not an act but a habit. 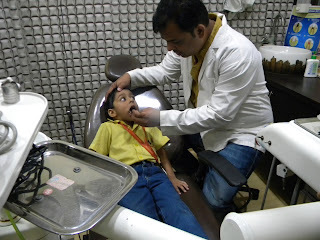 And you will get a healthy smile. camp on Friday July 29,2016. Children were excited for the dental check-up and were happy to know that their teeth are healthy. 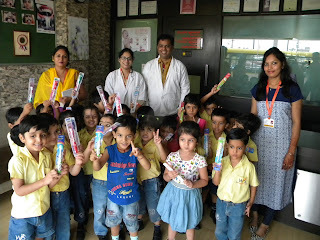 and eat healthy food.Children were introduced to the community helper Doctor & Dentist who helps us when we are sick. And bake it in the oven for baby and me. Children of Jr. KG section at Witty Kids were taken to ‘Domino’s Pizza Kitchen’ on Thursday, 28 July 2016 to have a hands on experience and to know more about a Baker and its process. 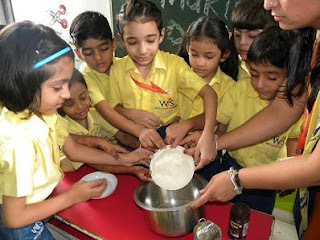 A live demo of the baking process was shown to the children which was a new learning experience for the little ones. 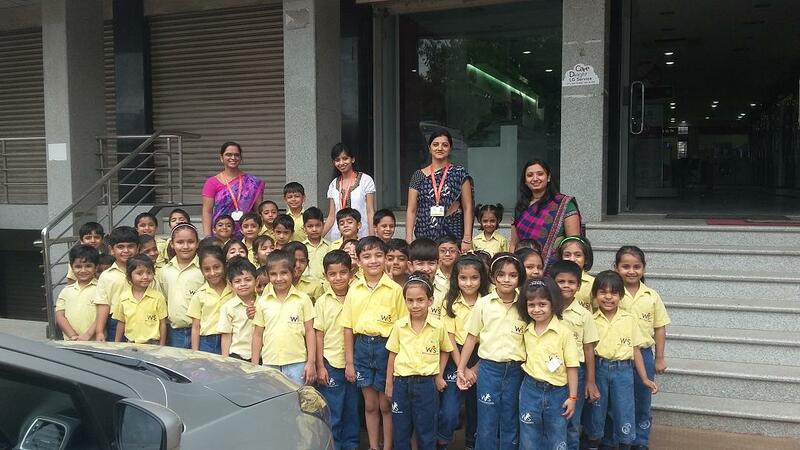 It was a fun filled experience with the aroma of the pizzas lingering in our minds even as we returned back to the school. It was indeed a mouth watering experience! Today student of GradeI B presented a special assembly paying tribute to late president of India Dr. A.P.J. Abdul Kalam on his first death anniversary. Group of students showed his life journey through a silent enactment. 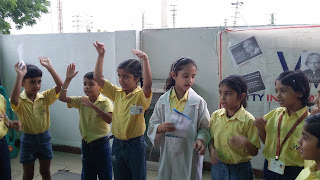 After that they recited an action rhyme written by Dr. Kalam – “THE VISION”. 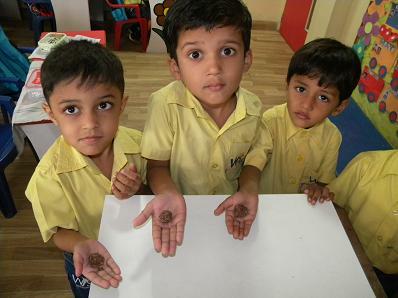 At last students keenly watched the videos of Kalam’s childhood, his school life and his working upon satellites. 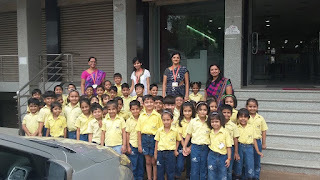 On 28 July, 2016 the Tiny tots of Sr. KG. went on a field trip of an electronic showroom. 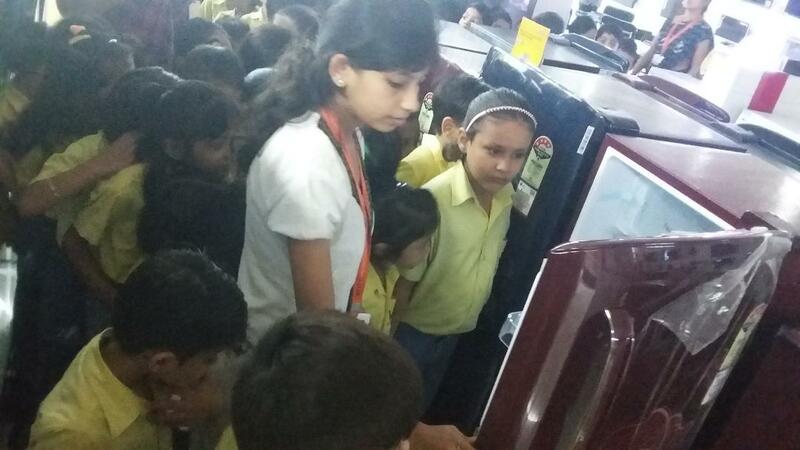 They were very excited to see different electronic items like refrigerator, television, washing machine, microwave etc . They were shown how the electronic items work. Store manager took them around the store and showed them different electronic items and explained them how they work. Students had an awesome learning experience. Parent’s day is dedicated to those caring parents who sacrifice their life in nurturing ours and their selfless commitment towards us. Parent's day is celebrated on 4th Sunday of every July. This day is marked by grand celebration. It is a day for the children to make their parents feel that how grateful they are for having such lovely parents. On Parents Day, they try to adopt every method in which they can make their parents feel special and convey their hearts feeling. Children take effort to thank their great parenting, which has shaped up their life in such a beautiful way. This has brought more kindness and positivity to the school campus. Pat it and prick it, and mark it with B. Passing by a bakery is always an experience which entices our sense of smell. But, visiting a Pizza parlour to see a live demo of the baking process, is a whole new learning in itself, and literally tantalizes the taste buds. 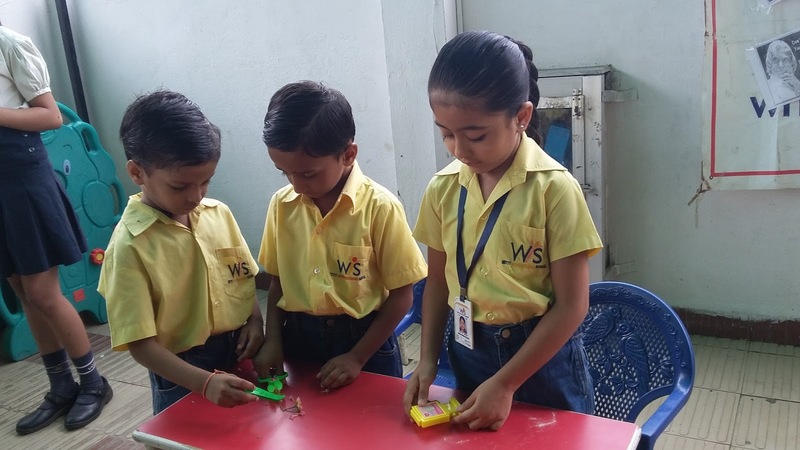 At Witty World we believe in letting our children make the most of their senses and in providing multiple opportunities for experiential learning. Children of Junior K.G section were taken to Dominos Pizza kitchen on Wednesday, 27th July 2016 to havea hands on experience with the real bakers & the chefs behind the scene. 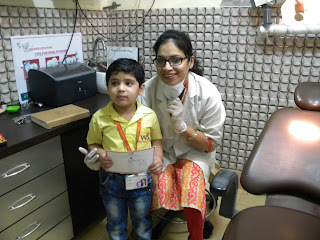 It was a memorable experience cherished by all. Cyber crime is emerging as a very serious threat in today’s world. The internet brings joy to our lives but at the same time it has some negative sides too. The cyber criminals are always in a search to find out the new ways to attack the possible internet victims. 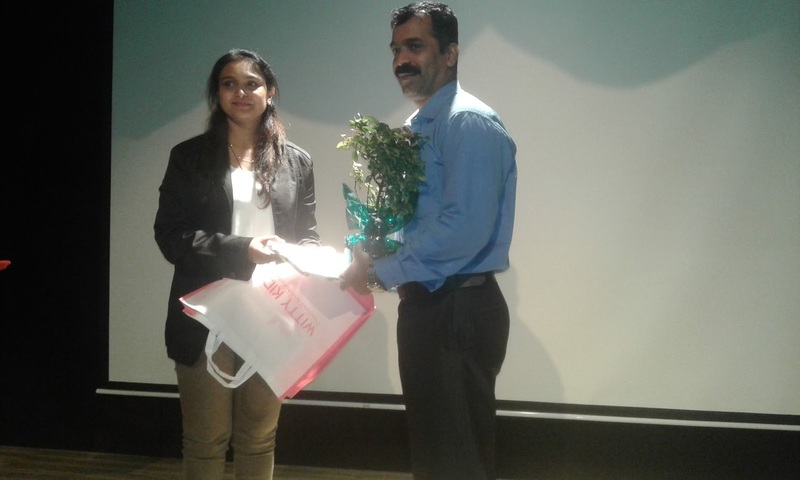 Witty International School, Pawan Baug in collaboration with Cyber Cell, Mumbai Police organized a seminar on ‘Cyber Crime Awareness’ to impart knowledge to the students and staff about the various issues related to cyber crime and hacking. The lecture was delivered by Shree Prakash Warke, Senior Officer at Cyber Cell Mumbai who interacted with the students for well over an hour, giving them an insight into the invisible world of cyber crime. Explaining the need for such a seminar, Principal Bijo Kurian said, “Today, everybody is using the computers i.e. from white collar employees to terrorists and from teenagers to adults. All the conventional crimes like forgery, extortion, kidnapping etc. are being done with the help of computers. New generation is growing up with computers and today all the monetary transactions are moving on to the internet. 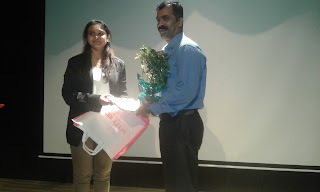 So, it has become very important for us to be aware of the various cybercrimes being committed with the help of computers.” Shree Warke informed the students about the various crimes happening in cyber world among the teenagers such as hacking, cyber stalking, phishing, online frauds and so on. He also enlightened the students with the safety and security tips to be a good and safe user of this cyber world. He also emphasized that students must never befriend people over the internet and should also not try to fix up a meeting with them without informing their parents. The now-indispensable Internet, Warke informed them, was attractive to criminals because they don’t need physical contact to harass their victims and they find it easy to hide within the cyber world. A social network, he informed them, may be a place for keeping up with friends, but it was also a place for cyber crimes. (Nearly all the students present in the hall had raised their hands when asked how many were active on Facebook). Stressing the importance of strong passwords and non disclosure of ATM pins students were explained case studies of banking related cyber crimes. The students also learnt about various pirated softwares and the consequences of using them. 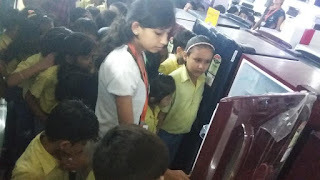 Students and teachers found this awareness campaign to be very interesting and informative, adding that Cyber Security Awareness Campaign is helping to lead the way towards the development of safer use of internet.